It was our pleasure in September to welcome Wendy Brown from Cancer Focus NI (formerly Ulster Cancer Foundation) to our weekly meeting. Wendy gave an informative talk about the charity. It receives limited funding from the government and all money raised goes towards projects in NI. Not only does Cancer Focus NI raise awareness about cancer through schools and business talks, including its 'keeping well van,' it has also funded the first cancer research unit at Queen's University. The charity is committed to outreach to older people in our commmunity and its care service works directly with cancer patients, including those with breast cancer and laryngectomies. Further services include counselling, art therapy, bereavement and family support. It runs a 'Zest for life' course over a six week period for post treatment patients which is therapeutically led with the support of a qualified counsellor. Cancer Focus NI is the only charity which offers expert bra fitting post treatment of breast cancer. Over 80 people per week take part in the 'Sing for Life' choir which is jointly funded by the charity and the Crescent Arts Centre. 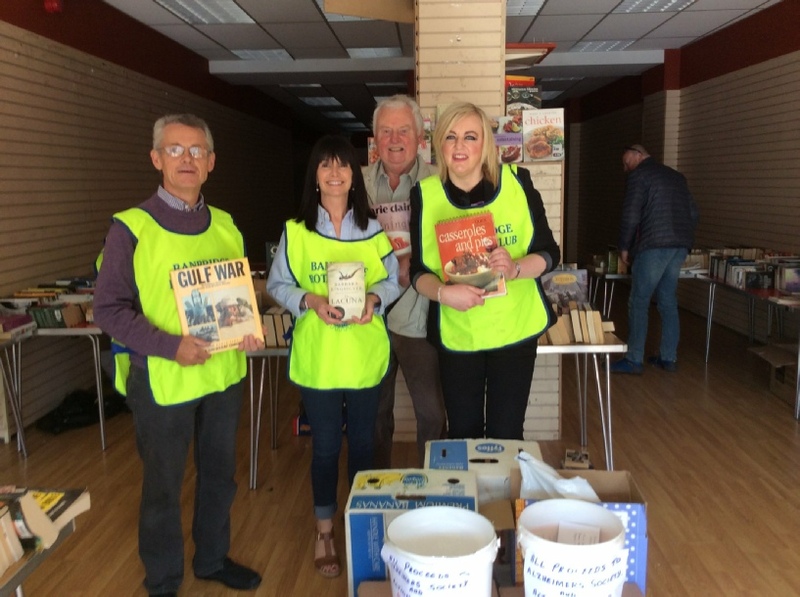 Friends of Cancer Focus NI groups, through which volunteers fund-raise for the charity, can be found in towns across the province, along with shops. We have one here in our own town! Cancer Focus NI will be 50 next year! 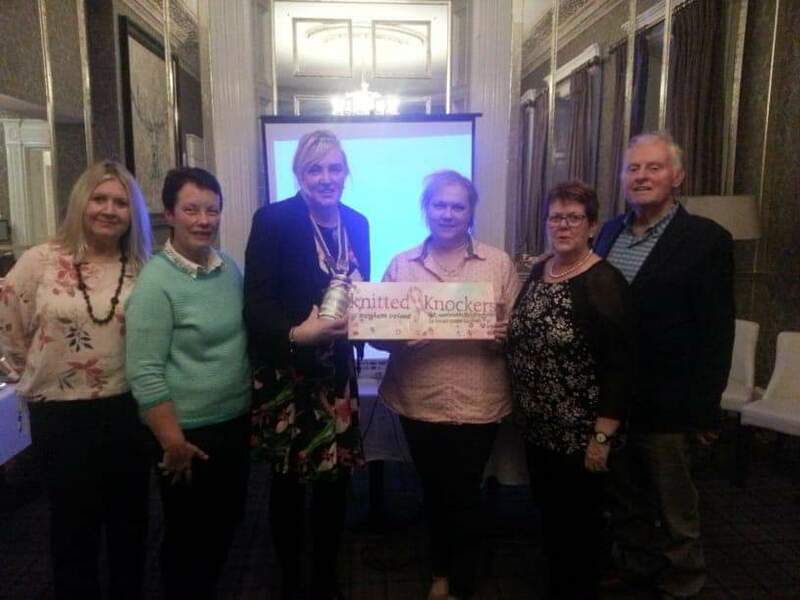 October was Breast Cancer Awareness Month and tonight we were joined by Joanne Harris, founder of Knitted Knockers. Joanne gave a very interesting talk about breast cancer and its impact on men as well as women. Despite women being affected most, some 16 men per year are diagnosed with breast cancer. Knitted Knockers provide handmade breast prosthetics for Women following mastectomy/breast operations. Volunteers knit 100% cotton breasts (acryllic breasts for swimming) and sew cotton fabric drain and tote bags and cushions for female and male patients. The group works closely with the Southern Area Health and Care Trust and is the registered provider of knitted cotton prosthetics in NI . It meets on the first Monday of each month at Brownlow House where you are welcome to join them to assist with knitting and stuffing the prosthetics and sewing drain and tote bags. Joanne received a retiring donation of £182 from President Tanya, whose father died from breast cancer in 2014, Rotarians and guests. 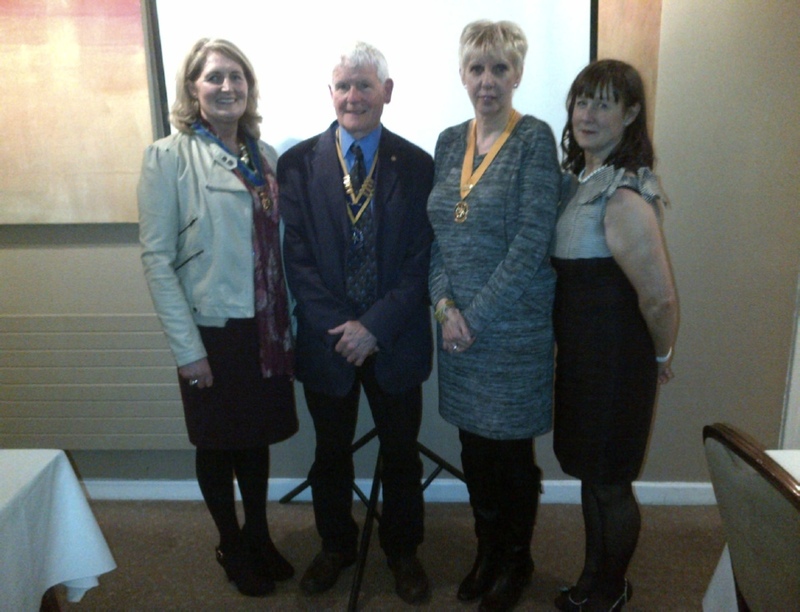 25 March 2014: Siobhan McKay (right) is Banbridge Rotary’s newest member. Also in the picture (left) is Maria McGilly from the Rotary Club of Armagh, who also doubles as District Chairperson of Vocational Services, President Louis Boyle and President-Elect Jennifer Ervine. 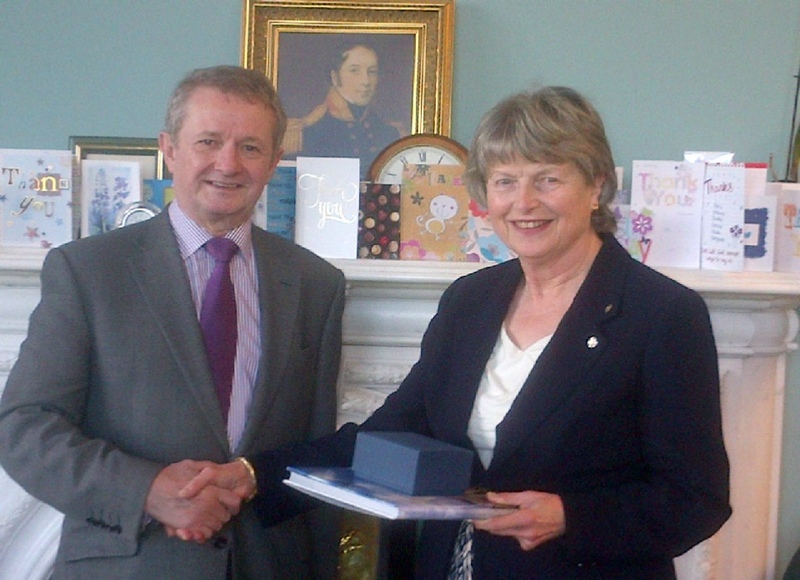 Rotarian Raymond Pollock presents a gift of a book and paperweight to mark District Governor Verity Swan's visit to Banbridge. Our guest speaker on Tuesday 8th April 2014 was Bro McFerran. He is the Managing Director of All State NI, a major IT Company with offices in Belfast and Strabane, They have an US parent company. The Jole Rider Bikes4Africa project is proceeding at a fantastic pace all over the country, and the organisers have been blown away by the response from Rotary clubs including Banbridge. 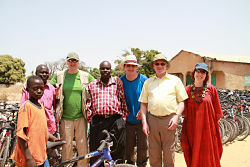 Already, bikes worth thousands of pounds have been gathered together, checked, repaired where necessary, and shipped to Gambia to help kids get to school. Also a “Paddy Charity Bike Run” has been organised to coincide with the Rotary Conference in Belfast. The proposal is to cycle from the Titanic Quarters starting out around 10:00AM on Sunday 28 September to Comber via the Greenway, and back. Nicole Parkinson-Kelly of Banbridge Academy will represent this area in the Euroscholar event in Strasbourg next year - more detail in our Club Projects/YLDC page. 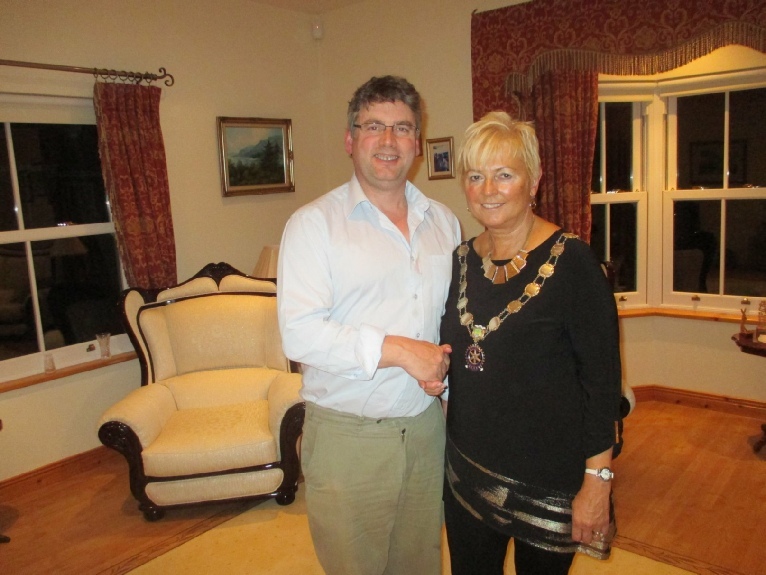 Banbridge Rotary Club held their Presidents Night in the Belmont Hotel, Banbridge on Friday 20 March 2015. Etertainment was provided by Ballroom Blitz a dance troupe from Belfast and there was dancing to the local group Quorum. Kenya Health Clinic (2.5 minutes). In a previous interview, Elaine Bannon of Light of Maasai, Kenya said ”when the Rotarians come, the children stop dying”. The Rotary Club of Banbridge was overwhelmed with the response from local businesses & residents to the BEST BIG BREAKFAST event held in the Belmont Hotel Banbridge. Rugby International Rory Best was star of the show at the fund raising breakfast, the proceeds of which will support Rotary Foundation and local charities that include Tinylife, Order of Malta, Special Olympics, Bothar and ‘Thanks for Life’. Rotary President Gerry McElvogue praised Rory for agreeing to host such an event in conjunction with the Rotary club for local people to have the opportunity to hear all the stories from the World Cup and have a photo taken with such an amazing ambassador for sport and for the Banbridge District. The Rotary Club of Banbridge has a long standing and vibrant association with The Rotary Club of Dublin Fingal, and no opportunity is missed to maintain this link. One notable contact was on the Saturday of our Rotary Conference in Belfast in September 2004, when both clubs met up with the Rotary Club of Renfrew. This turned into a very special occasion topped by that marvellous concert in Spires. We are also twinned with The Rotary Club of Renfrew in District 1230 in Scotland and both clubs make every effort to foster this arrangement. A 14 Banbridge strong party made the trip to Renfrew at the end of May 2002 to join in the 50th anniversary of their charter. During the 1999-2000 Rotary year, The Rotary Club of Navan took an enterprising approach to striking up a relationship with another club. They sat with the Rotary directory and a map of Ireland to find the closest club which met on a Tuesday evening. That club was Banbridge, and a close relationship has existed ever since; the two clubs endeavour to host the other on alternate years - either a weekly meeting with a keynote speaker, or at President’s Night. "The Rotary Club of Banbridge recently paid a visit to the Kingspan Rugby stadium where they were welcomed by Ulster Branch President Bobby Stewart. The first part of the visit took them around various parts of the stadium including the changing rooms, the stands and the gym. Irish international Tommy Bowe was undertaking some light training in the gym at the time which led to some Rotarians commenting that they felt they could do at least as well as he was doing! Thankfully, they did not have the opportunity to put their bravado to the test! 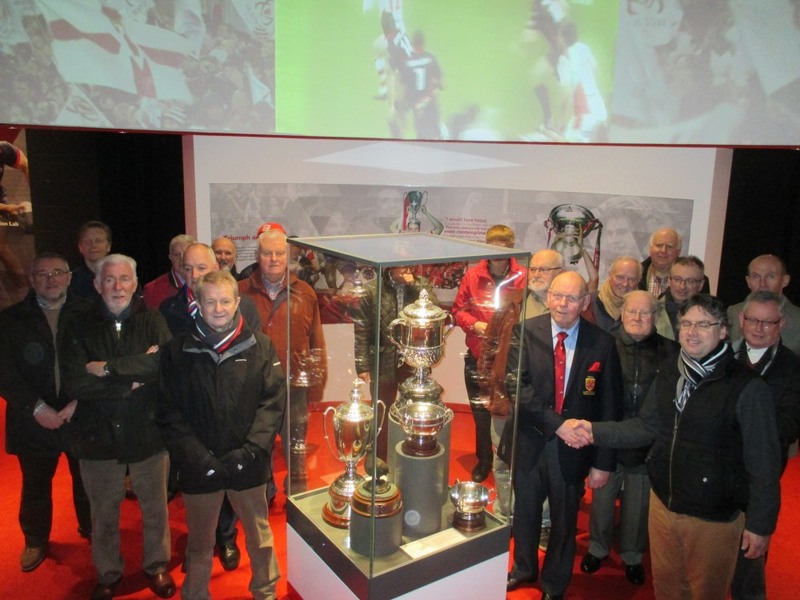 The second part of the visit was to the recently opened Nevin Spence Centre where they were able to view the excellent display illustrating the development of Ulster rugby throughout the years. Particularly poignant, however, was the section devoted to Nevin Spence, who, tragically, was killed, along with his father and brother, in a farming accident. 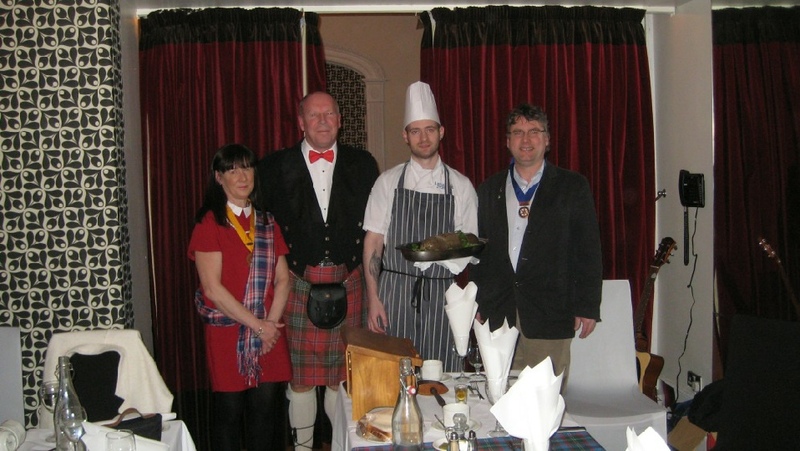 The afternoon concluded with an excellent meal in Ormeau Golf Club." The Paul Harris Award is named in memory of the founder of Rotary International. Rotary was founded in Chicago in 1906.Rotarians worldwide strive to advance world understanding,goodwill and peace through the improvement of health, the support of education and the alleviation of poverty. The Rotarian of the Rotary Club of Banbridge in a tribute to one who shares these principles decided recently to grant a Paul Harris Award to a local business man who was assisted the Rotary Club over many years. 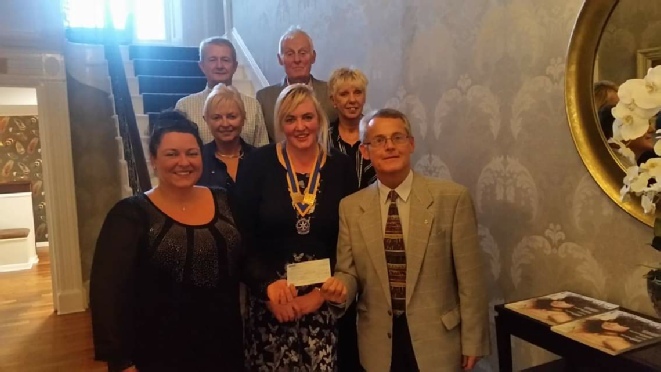 The Rotary Club has a long record of fund raising for local, national and international charities in Banbridge and depends on the goodwill and generosity of people in this area. As we all know there are increasing demands on all charities and so organisations need to plan carefully how and when to approach the public for support. The Banbridge Club has been conscious that there are regular street collections in the town and have sought other venues to hold collections. About eight years ago Rotary approached the management of Centra Supermarket, now named Eurospar here in Banbridge seeking approval to hold charity collections on their premises once or twice a year. 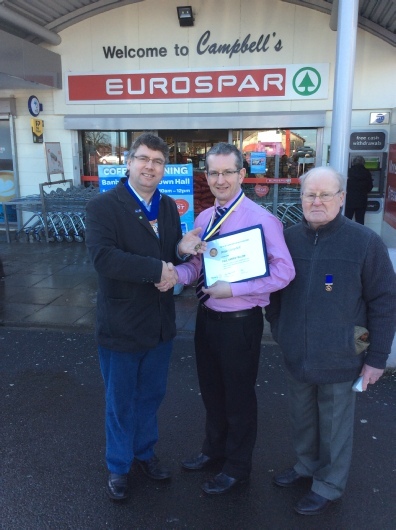 Not only was permission granted but our Rotary members were welcomed and assisted by the staff of Eurospar on every occasion. The customers of that supermarket have got to know us over the years and contribute generously to our charity collections. All of this would not have been possible without the active cooperation and assistance of the owner and directors of Eurospar and in particular Mr Brian Campbell. Rotary International wishes to recognise the magnificent contribution to our charity collections by Brian Campbell and in December past in the Belmont Hotel at our annual Christmas dinner the President Gerry McElvogue of the Banbridge Club presented him with a Paul Harris award (also in the picture is Past President Eddie Carr). This is the highest award which Rotary can make to individuals. 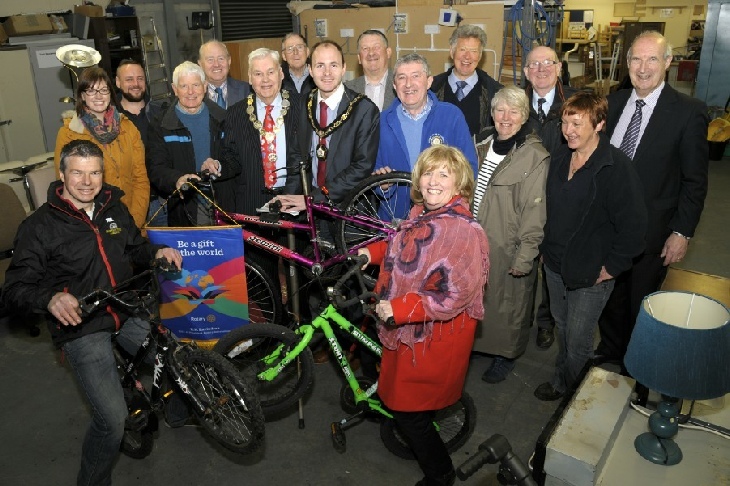 The Mayor of the Armagh Banbridge Craigavon Council, with Paul Thompson and Past President Louis Boyle representing Banbridge Rotary, Lurgan Rotary representative and Ernest Lawson, President of The Rotary Club of Portadown attended the launch of the Bikes for Africa scheme which Banbridge Rotary have been supporting for the past few years. The ABC Council have now agreed that all bikes delivered to any of their depots will be sent on to the recycling centre in Banbridge. This particular scheme has been sponsored by the Rotary Club of Portadown.